The Green Turtles (Chelonia mydas) are the second largest of all sea turtles species. They can grow up to 3 to 4 feet in carapace length (83 – 114 cm) and can weigh up between 239 to 872 pounds. 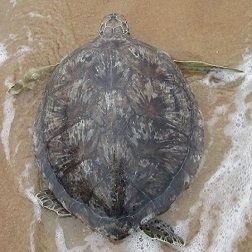 They are named because of the green color of the fat under the shell and have only four lateral scutes. When the Greens are smaller, they eat worms, young shellfish, aquatic insects, sea grasses and algae; whereas when they grow into adult, they feed almost exclusively on seagrasses and algae. Because their jaws are saw-like, it enables them to tear vegetation. The Green turtles stay mostly near the coastline and around islands and can live in the lagoons, bays and protected shores, especially in areas with sea grass beds. They nest between 3 to 5 times per season at an interval of 2 to 4 years. On the average, they lay up to 115 eggs in each nest and their eggs get developed in about 60 days. The Green turtle hatchlings are dark-brown or nearly black with a white underneath and white flipper margins. They are found in all temperature and tropical waters throughout the world.